Green burials are becoming an increasingly prominent segment of the mortuary business. On the surface, it would appear to be a trend based strictly on environmental conservationism. Green is good, and if there is an opportunity to reduce our carbon footprint, even in the afterlife, it seems like a positive thing to do for our planet. While this is true and is certainly the primary motivating factor behind the upward trend of green burial, some people see it as a more natural way (pun intended) to handle the remains of the deceased. Many look at it as a return to the roots of their culture and many find a tie to their religious beliefs through green ceremony. No matter the motivation, the mortuary industry is taking notice. A 2015 study by the Funeral and Memorial Information Council says 64 percent of people 40 and older "expressed interest" in green burials. It's a segment that simply can't be ignored. So you know you need to be able to provide a green burial package. But how do you do it? It might not be as hard to offer this to your customers as you think. There are some misconceptions out there that we can clear up for you, and you might find that your concerns about being able to offer green services are unwarranted. Myth #1: It's hard to do a green service if you have to ship a body somewhere. A common misconception is that you have to embalm a body before you ship it. If that were the case, green burial with a shipped body would be impossible. The truth is, you don't have to embalm a body to ship it elsewhere, so don't let that prevent you from offering green burial packages. Myth #2: There aren't many cemeteries offering green plots. According to the Funeral Consumers Alliance, the first green cemetery opened in the US in 1998 and about 60 operate here today. The Green Burial Council offers a provider directory, so you can find a cemetery in just about every state. Some are completely natural, meaning they offer no traditional burial services, while some are hybrids, meaning are traditional cemeteries with a special section for green burial. Myth #3: Embalming a body preserves it longer once buried. Embalming a body will help you have an open casket. For those first few days, as arrangements are being made, embalming is a must if you want to have a viewing. Funeral homes can refuse to host a viewing for a body that hasn't been embalmed. But embalming is strictly cosmetic and hygienic. As many of us remember from our days in mortuary school, the embalming provides temporary preservation and restoration. Myth #4: Burying a body with no embalming will contaminate the soil and animals will dig it up. Two morbid thoughts in one. The idea of wild dogs running down the street with body parts hanging from their mouths is a concept right out of a horror movie. Funeralone.com puts our mind at ease: "Green burials require an 18-24 inch soil and smell barrier between the burial container or shroud and the surface of the ground. This depth of soil is more than sufficient to remove any smell that animals, much fewer humans, can detect." So no worries about the animals. As for the environmental impact, contamination from bodies come from the chemicals that are put inside the body, not the body itself. Green cemeteries have strict guidelines to ensure that there will be no impact on groundwater. So rest assured, these nightmare scenarios are far fetched and in fact will never happen. Still unsure where to begin with planning green funerals for your clients? That's why we're here! 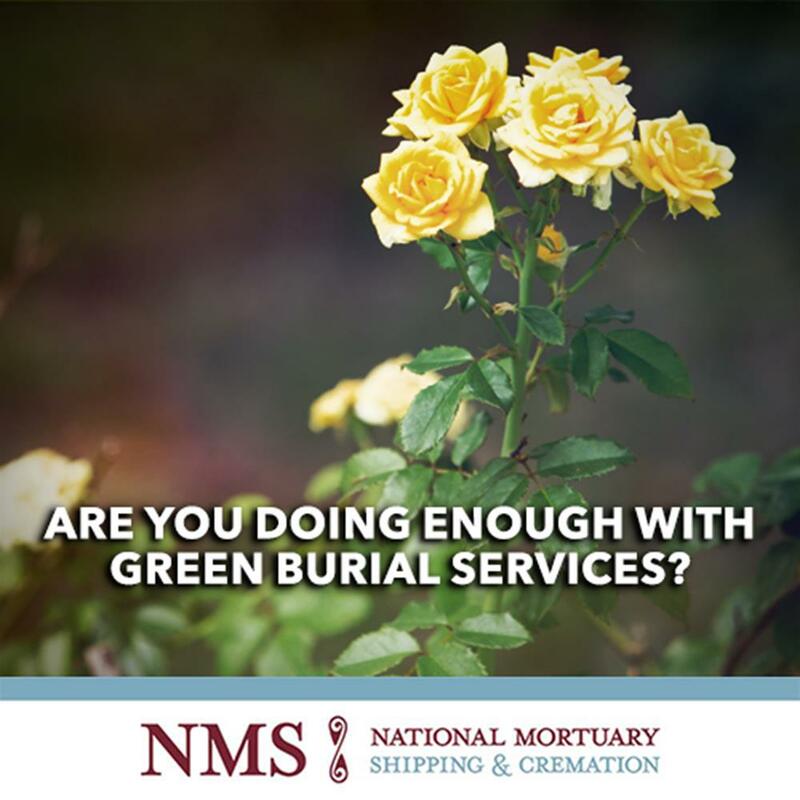 Not only can NMS help you plan a green funeral service in your area, but we can also plan it anywhere in the world. No matter your mortuary industry needs, we are here to help. Contact us today for more information on green funeral services and let us take care of your needs while you take care of the families you serve.